Truly accurate signals deserve to be operated in a prototypical manner as shown here in the new gfcontols.co.uk “dual operating unit”. Designed specifically to replicate the dwell, latching and of course the “bounce” of a real semaphore signal. The dual unit will operate two signals, either upper or lower quadrant but can also easily be changed to operate other railway features such as crossing gates etc. by means of a built in switch to remove the “bounce” aspect. This can also be used to operate turnouts using servos. Easy to fit and fine tuning of your signals could not be simpler. Now available, the “dual” is only £25, servos are extra and can be readily purchased from model aircraft shops as well as from ourselves. A super view of Steve Hewitt’s signals on John Holden’s Liverpool Lime Street railway which clearly demonstrate the dwell and bounce features of our “dual” unit, as used on this fabulous model. This photograph from Mr S in Dorset shows our Dual units operating Semaphore signals and Dollies on his delightful new Railway. 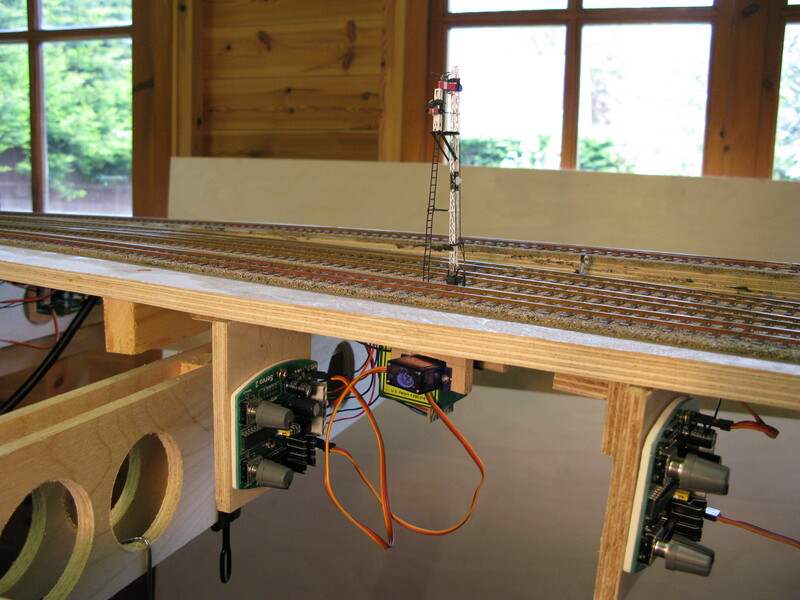 One of the dollies (working ground signals) is just visible in front of the main signal post towards the rear of the baseboard.